Tides for Sandy Hook High @ 0400h (3.7 ft.) & 1631h (4.7 ft.); Low @ 1018h (1.2 ft.) & 2320h (1.0 ft.); Currents in Sandy Hook Channel Flood: 0120h (1.0 kt. ), 1344h (1.7 kts. ); Ebb: 0744h (1.1 kts. ), 2028h (1.4 kts. ); weather from Sandy Hook to Fire Island AM: SE winds 10 kts., seas 3-5 ft., PM: S winds 10-15 kts., seas 204 feet. Today is my last full day on the NOAA Ship THOMAS JEFFERSON. My goal today is to clean up any loose ends before I leave the ship tomorrow: laundry, catch up on my log, take a few extra photos, etc. Like the previous three days the sky is gray. I can’t even see Manhattan. Fortunately, the seas have calmed and I am quite sure the launches will be deployed. I am not scheduled to be on a launch, but Andy is going out. He switches between two full days of launch duty, and then two days of watch duty: 0330h to 0730h, and 1530h to 1930h. They do keep him busy. For lunch I had chicken tacos and lasagna. A brief note on Chief Steward Dave – he sure must like to cook chicken. It was served to us often and in a variety of styles. All in all, Dave and his crew do an excellent job of feeding us and deserve a commendation. There was always something to eat, and no one left the Mess Deck hungry. I also found time to go up to the bridge and chat with Megan Nadeau. Megan is from Lewiston, Maine and gave me a good interview. After two years at the University of New Hampshire, Megan graduated from the University of Maine with a B.S. degree in Marine Science. She seems to really enjoy her role on the THOMAS JEFFERSON, and has a nice career plan ahead of her. The Field Operations Officer – affectionately referred to as “The FOO” – Chris Van Westendorp, joined us on the bridge and I was able to interview him as well. 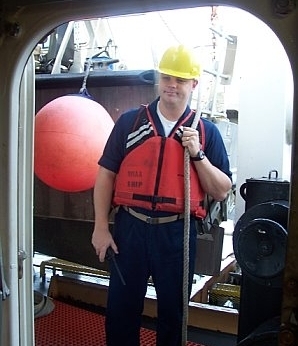 Chris has quite an experienced past that includes years on a Navy submarine and a degree in Marine Science. As I noted in a previous log entry, the interview is pretty straight forward, except the last question about who will play you in my Hollywood blockbuster. Those I interviewed almost always paused when I asked this question. Some of the answers I got were funny, others quite revealing. At the end of the day I did a little more computer work, ate dinner, exercised, and began the packing process. I even washed and dried my sweaty exercise cloths. After a little “White Fang” I was asleep by 2230h.